Millions of people are fleeing because of various reasons. In some regions on our earth, human rights are still neglected despite the right for human dignity for all inhabitants on this earth laid down in the UN Charter. It does not help much that the UN Charter is adopted in many countries. This is a scandal which has to be recollected repeatedly into public’s awareness. “Human dignity can not be subject to where somebody was born by coincidence.” said IB’s chairman, Thiemo Fojkar. 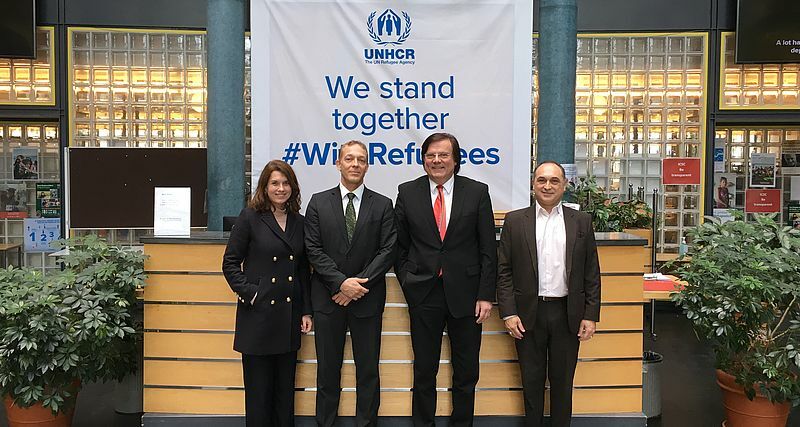 On March 12th, he visited as a member of IB’s delegates the headquarters of the United Nations High Commissioner for Refugees of the UNHCR in Geneva. Fojkar is also the president of the European Association of Institutes for Vocational Training (EVBB). A closer political interlocking of sustainable projects with the UNHCR’s activities for refugees is the IB‘s and the EVBB’s aim. Daniel Endres, director of the Division of Resilience and Solutions was the interlocutor in Geneva. It quickly became clear how necessary it is to link funding instruments on a national, European and international level to each other. At this point, the IB as a group of companies as well as through its association work on a national and European level, it can make a major contribution and also of its range of services in order to combat the reasons for flight in the Countries of origin. Now, the objective is a strategic cooperation between the UN’s activities for refugees and the IB. “If we join all forces, we will be able to work sustainably and successfully even with limited opportunities”, stated Fojkar. Numerous German organisations active in activities for refugees won praise for their engagement from the employees of the UN Commission for Refugees. With a deep regeret, the USA took note of drastic cutbacks of the means for the UNHCR. “National egoism can not have a future in our connected world”, Fojkar noticed as a conclusion of the exchange of views in Geneva. Meeting in Geneva: Anne Jähn of IB, Daniel Endres, director of the Division of Resilience and Solutions, IB’s chairman Thiemo Fojkar, and Francesco Genova, managing director of the ENAIP Internationaler Bund GmbH in Switzerland.